The staff of All American Door, Inc.has been doing business since 1989, 10 years later established the corporation in 1999 due to their quality, positive reputation and the professional business practices of the staff of All American Door, Inc. AAD quickly become one of the leaders with-in Orange County, California, with services ranging from Residential, Commercial & Industrial custom Garage Doors, Openers, Entry Doors, Interior Doors, French Doors, Windows, Gate Operators and much, much more. Our quick follow up, positive business practices, award winning services and Better Business Bureau reporting have aloud us to become a AAA Rated Company which we take great pride of. So please call on us for any of your upgrading and remodels needs, and feel free to browse our website and view our suppliers, client testimonials and services of All American, Inc. Thank you for stopping by. We have two locations to serve you - Fullerton and Laguna Hills. Multiple dealer of the month awards. All American Door is rated 5.0 out of 5 by 10. Rated 5 out of 5 by Leebird from Outstanidng service and workmanship. Found All American Door on the internet. What an outstanding overall experience it was dealing with this company. From the initial sales call through the installation, I was thoroughly impressed. The installation was on time as quoted. The crew that installed the sliders was the most professional, clean, well organized, considerate crew I have ever dealt wth. Constantly keeping an eye on the details as the installation continued. I would highly recommend this company, and have done so repeatedly. If you are in the market for new window and doors, All American Window and Door is the only company I will do business with. Rated 5 out of 5 by sethofdeath from Exceptional work, Quick and professional!! I was refereed to All American by a friend and I couldn't be happier with the work that was performed. I replaced 4 sliding glass doors 2 8 foot doors, a 12ft door and a 14ft door. The pricing was great and the installation was a snap. Greg and his team; Alanis, Dave, Jose, Reyes, and Carlos were all very professional and made sure that I was completely satisfied with the work before they left. Then to top it all off I received a followup call from Greg making sure I was happy with the installation and to see if I had any questions. One of the sliding doors needed a slight adjustment and they came out the same day to adjust the handle.. I cant say enough great things about this company and their staff. I highly recommend them and are now my got for all things windows and doors!! Rated 5 out of 5 by CarolofFullerton from Greg and his team are the best!! I was very impressed with All American's service, product, employees professionalism & dedication for customer satisfaction! I have worked with many other various construction type teams and none can compare with All American Door. I will use them again and refer them whenever possible. 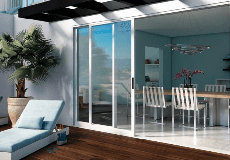 The Milgard sliding door is beautiful & impeccably installed. They did the new construction type install and totally cleaned up every bit of the debris when finished. The installers were polite, considerate and great workers. Thank you American Door! Rated 5 out of 5 by karnjer2 from Very satisfactory experience Our sales and install experiences were very good with timely, knowledgeable service. The installers were on time and clean-up was well done. I felt the pricing was definitely competitive and I was very satisfied overall. Rated 5 out of 5 by Nando from This dealer is very professional I ordered my slider and windows through All American Doors. I was referred to them by a friend. They have a nice little show room that displays the different types of windows. I had my windows delivered in about a week and his installers did a nice clean job. I would highly recommend them!